Flashy Kiuna family not only for their flashy lifestyle but love seems wafting in the horizon of their vicinity. 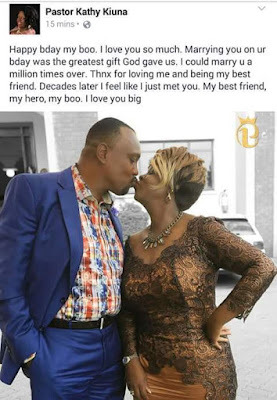 Rev Kathy Kiuna celebrated her husband’s birthday and went ahead to share a photo on social media as she smothers her husband’s chubby cheeks. Not only did she post the photo but she captioned it revealing how she loves her boo and expressed how she feels for him.